Inspired by the recent inauguration of the new Makriyannis Wing, Maria Georgopoulou, Director of the Gennadius Library, here contributes an essay about the festivities that took place during the dedication of the Library in April 1926. On June 2, 2018 the American School inaugurated the new Makriyannis Wing of the Gennadius Library. During the preparations for the opening, I was tempted to look back at the festivities for the inauguration of the Gennadius Library itself in 1926. As with other momentous moments in his life, John Gennadius was keen to keep in his scrapbooks as much information as possible about the events (Opening Exercises of the Gennadius Library, preserved in Scrapbook Φ38, p. 36). “Dear Mother: How far are we responsible for already inherited faults? That old Sam Hill, by whom folks used to swear when they dared not take greater names in vain, brought over to Vermont at the end of the eighteenth century among his numerous children one son, Lionel, destined to surpass in dilatoriness all the other slow-going Hills of his generation. He married very tardily and begat two sons, both in due time notable procrastinators, the greater of them being the younger, named Alson, who added to more than a full measure of the family instinct for unreasoning delay an excellent skill in finding good reasons for postponing whatever was to be done. Alson Hill was my father…”. Bert Hodge Hill (1874-1958) addressed these thoughts to his mother from Old Corinth on February 28, 1933 when he was almost 60 years old. Hill, however, never mailed the letter because she had died when he was barely four years old. Bert Hodge Hill as a young boy and as a middle-aged man. ASCSA Archives, Bert H. Hill Papers. On Saturday December 27, 1902, a well-publicized wedding took place in London. 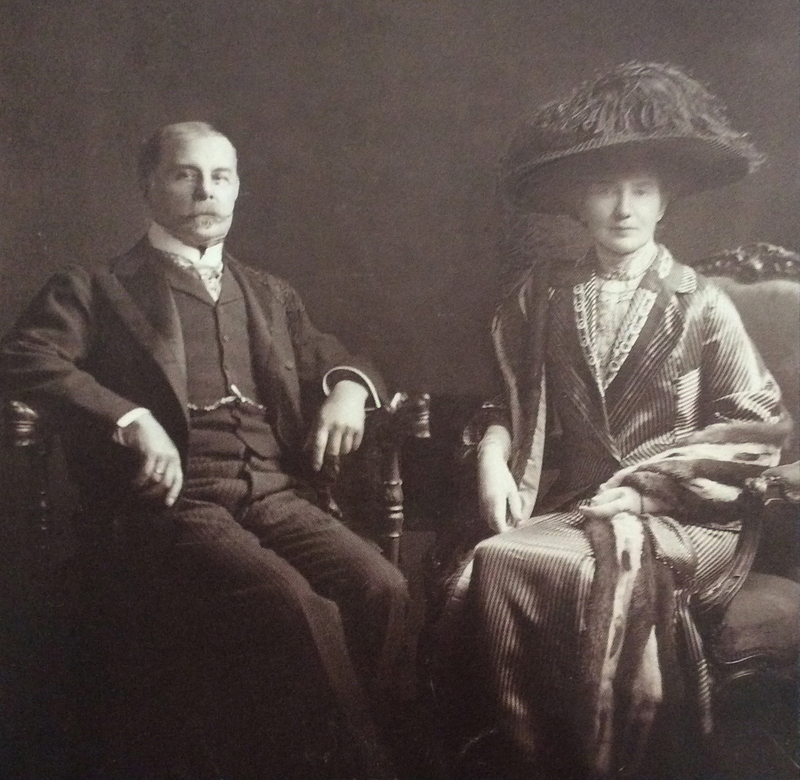 John Gennadius, former ambassador of Greece to England and a great book-collector, age 58, and Florence Laing, the youngest daughter of Samuel Laing and the widow of painter Edward Sherard Kennedy, age 47, were married in a double ceremony, first at the Greek Orthodox church of St. Sophia and later that day at the Anglican church of St. Peter’s at Cranley Gardens. There are no photos capturing the ceremony or the reception that followed, but Gennadius, the creator of more than seventy scrapbooks, did keep numerous newspaper clippings announcing this celebrated marriage. More than a few of them mention that the bride had an annual income of roughly 8,000 pounds, leading some to hint that it may have been a marriage of convenience. Time proved that their union was a harmonious one; it lasted 30 years until his death in 1932. She outlived him by another twenty years. The Gennadius Library of the American School of Classical Studies at Athens (ASCSA or the School hereafter) was the offspring of their union. The deed of gift was signed in 1922 and the building was completed in 1926. John and Florence Gennadius, 1920. Source: ASCSA, Gennadius Library. Professors to the Rescue: Americans in the Aegean at the End of the Great War, 1918-1919. “The haughty arrogance of the Nordic people”: A Scandal in the German Colony of Athens on the 20th of April 1935. A diary for the project. To record the processes of arrangement, cataloguing and digitisation.